History in the making in Croke Park next Sunday as Limerick and Waterford clash in the Allianz hurling league final for the first time. Having beaten Dublin in the first semi-final in Nowlan Park, Limerick saw Waterford book a place in the final with strong second half-showing which proved too much for Galway. The Tribesmen led until the 56th minute, but wilted in the face of a powerful Waterford surge, which yielded five points. 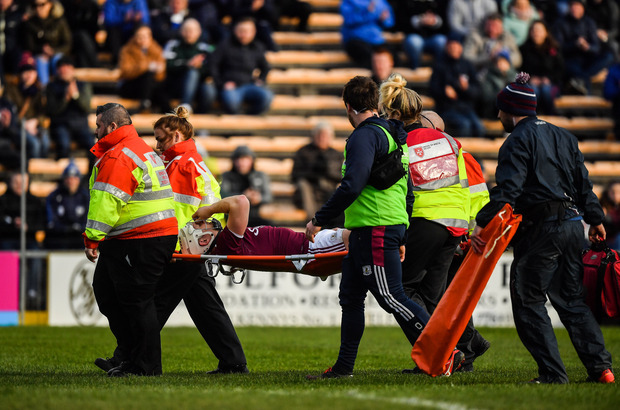 Galway didn’t score again until the seventh minute of stoppage time and their misery was compounded by the sight of Joe Canning being stretchered off late on. Waterford’s success was all the more noteworthy as they were down to 14 men for the last quarter after Mikey Kearney was sent off on a second yellow card in the 54th minute. Despite that, there were times after that when it looked as if they had the extra man against a Galway team that clearly has a lot of work to do before heading out in the Leinster championship. Waterford were well ahead in all facets in the final quarter, applying energy and determination levels which Galway failed to match. They led by 0-12 to 1-7 at half-time, having earlier enjoyed a five-point advantage. However, it was cut to two after Waterford scored 1-1 just before the break. The goal came after a long range free by Stephen Bennett flew to the net via a thicket of hurleys. He added a point from a free before Canning closed out the scoring with a pointed free. Galway started in blistering fashion, racing into a 0-5 to 0-1 lead after four minutes. Waterford settled after that but were still five points adrift at the end of the first quarter before raising the tempo and scoring 0-3. A great save by Waterford goalkeeper, Stephen O’Keeffe, denied Galway a goal in the 19th minute, deflecting Kevin Hussey’s shot clear. Hussey had been played in by Joe Canning, who later had a drive for goal turned out for a ‘65. Galway added three points but Waterford finished strongly, helped enormously by the rather fortuitous goal. Scorers: Waterford: Stephen Bennett 1-7 (1-6 frees), Pauric Mahony 0-3, J Barron 0-2, M Kearney, J Prendergast, A Gleeson, T Ryan, P Hogan, C Lyons 0-1 each. Waterford: S O’Keeffe; S McNulty, C Lyons:, N Connors; Philip Mahony, K Moran, A Gleeson; J Barron, T De Burca; C Dunford, M Kearney, Pauric Mahony; T Ryan, Stephen Bennett, Shane Bennett. Sub: J Prendergast for Dunford (ht), P Hogan for Ryan (51), C Roche for De Burca (64), DJ Foran for Gleeson (70). Galway: F Flannery; P Killeen, R Burke, D Morrissey;A Harte, P Mannion, G McInerney; CMannion , K Hussey, J Coen, C Whelan, J Canning; B Concannon, N Burke, D Glennon.